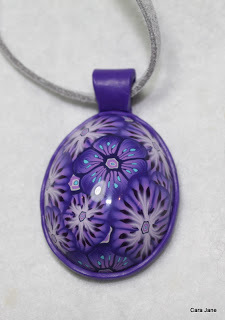 I have been asked a couple of questions about my purple flowery cabochon pendant so here’s a little more information about how I made it. Looking at the colour differences due to the lighting in my pictures I really should go back to using my photography set up but I took these pictures as a record for me rather than for sharing with you. First I made 2 canes (typically I made them with little bits left over from another project so they were tiny and of course beautiful! If I had made them larger they wouldn’t have been so nice, it’s the cane law!). I then hand formed a cabochon shape from scrap clay, starting with a ball shape which I cut in half and smoothed it down onto my work surface. 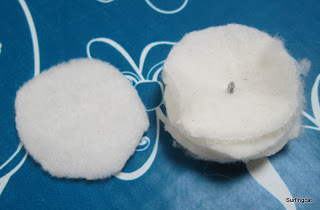 I don’t get the shape perfect at this stage as it will be squashed about when I add the decoration. When making this pendant I couldn’t decide whether to give it a border ‘frame’ or not. So I took a picture without then added one and took a picture with the border so I could compare side by side. I decided the ‘frame’ added to the look of the pendant so was worth the extra time. These pendants have been sanded but not buffed. I make the basic shape, bake and sand it then I add the backing, bail and a border. It’s then baked and repolished with the last few grades of sand paper only and buffed with my homemade dremel buffing wheel. I have tested it out and found you don’t get a better shine particularly by sanding and rebaking but it does mean it is easier to sand right to the edge if there isn’t a border in the way. 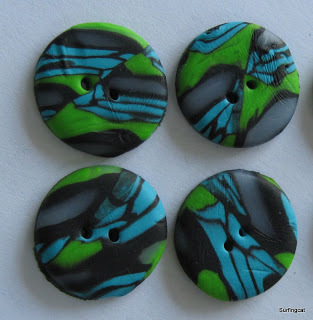 It is better to add the backing, bail and border to a baked cabochon as you don’t distort it whilst doing so. This is just gorgeous Cara! Very beautiful colors and design, love the shiny polished end result! Your canes are great. Not smeary, but sharp detail. Your a master! “The Cane Law” ROTFLOL SO True!!! !